↑ "DPR Korea 2008 Population Census National Report". প্ৰকাশক Pyongyang: DPRK Central Bureau of Statistics. 2009. http://unstats.un.org/unsd/demographic/sources/census/2010_PHC/North_Korea/Final%20national%20census%20report.pdf। আহৰণ কৰা হৈছে: 19 February 2011. 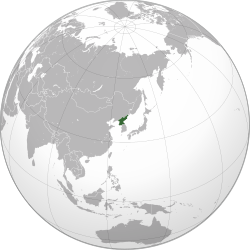 ↑ 2.0 2.1 North Korea, CIA World Factbook, accessed on 31 March 2013. ↑ 3.0 3.1 National Accounts Main Aggregate Database, United Nations Statistics Division, December 2012. ↑ "Turning back the clock - North Korea creates Pyongyang Standard Time". Reuters. 6 August 2015. http://www.reuters.com/article/2015/08/07/northkorea-time-idINKCN0QC04C20150807. ↑ Frank Jacobs (21 February 2012). "Manchurian Trivia" (blog by expert). The New York Times. http://opinionator.blogs.nytimes.com/2012/02/21/manchurian-trivia/। আহৰণ কৰা হৈছে: 27 August 2012. ↑ "Constitution of the DPRK". http://naenara.com.kp/en/great/constitution.php?22। আহৰণ কৰা হৈছে: 18 May 2014.